Taking peer-to-peer direct wireless transfers to new heights, a new video shows Apple's AirDrop technology being used to send pictures taken from one plane to another in-flight, at 35,000 feet. 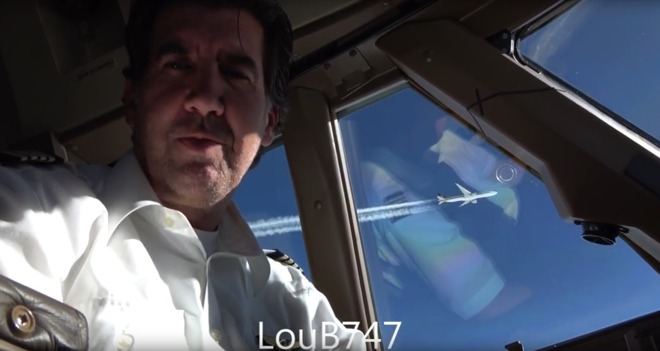 Frequent YouTube poster LouB747 posted the video on Aug. 3. The video depicts him in the pilot seat, communicating from 35,000 feet, with the other Singapore Airlines plane at 36,000 feet in close proximity. The pilot sent pictures of the plane in flight to the other plane, with the recipient acknowledging receipt on the plane's radio. The YouTube channel contains many other videos about commercial aviation. The physics of Wi-Fi and Bluetooth are a bit different at altitude, with no intervening obstacles other than the aircraft's skin. While Apple's published data on Bluetooth and wi-fi note a range of 30 feet, both Bluetooth and Wi-Fi have significantly longer ranges at ground level even with obstacles. Presumably, the thinner air, the line-of-sight, and lack of notable RF shielding increase the range on the technology at that altitude. While AppleInsider couldn't directly confirm the authenticity of the transfer as depicted, we spoke to a former naval aviator who has transitioned to commercial flight. He confirmed to us that this is not all that uncommon amongst pilots, and he has done it at approximately the same range and altitude on more than one occasion.